Webcredible a London based usability and accessibility consultancy has just published a guide to directory submissions in which World Site Index is listed as one of the recommended directories. In our opinion this guide is worth a read by all those involved in submitting sites to directories. Of particular note is the section on choosing anchor text for your listing. Anchor text selection might not seem a big deal, but as a directory we see a significant number of submitters, even professional submission companies, simply ignore our requirements and stuff the anchor text, title, with as many keywords as possible. These people often complain when their anchor text is changed and in some extreme cases the result is removal and banning of their site from the directory. Following the advice given in the article will place submitters to World Site Index in a much stronger position to have their preferred anchor text used. Back in May 2007 we added the ability for listed sites to push news items in real-time for publication on World Site Index, however take up of the service has been disappointing, either people are not understanding it or they are so focused on getting a link at any cost they ignoring other advertising options. This weekend sees the owner of wizz.to travel and tourism directory making full use of the live news publishing system, he’s using the feed to advertise that they are offering free ads for a limited time. Since the news item was published a few thousand potentials have passed through the home page of World Site Index and been exposed to their offer. You might be wondering how much this cost? The answer is nothing, once a site is listed within or database it is currently free for site owners to push news items. If you are interested in pushing your news items to us for publication then have a read of the how-to guide and then you can start pushing news using the news submission form. We are pleased to now be offering a selection of free templates for users of WordPress. 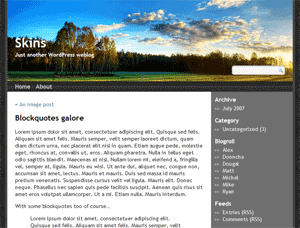 The templates are all widget ready and were built on WordPress 2.2. At the moment we have 3 templates available for download but will be increasing the number as time permits. You can view thumbnails of the themes and download them from our themes page. must get a link, must get a link! We offer free submissions and because of this we get vast numbers per day, yet people don’t follow the simplest rule and then if we discard the listing because it is incorrect they complain bitterly, however if we rewrite their text so that it follows our guidelines then they complain bitterly that we changed it. We ask that people use the company name as the title of their listing, we don’t mind a couple of keywords, but a quick look at the review queue shows about 50% of the pending free submissions are submitted with keyword stuffed titles. Some of these sites are submitted by so called professional SEO or submission companies which have almost certainly been paid by their clients to submit the site to us. The client is probably blissfully unaware that they are paying and getting nothing in return. We get submissions with a description with 3 or 4 words repeated over and over again to make it meet the minimum word requirement? This just defies belief, if it was my site I’d want people to see my listing with well written text as it shows I’m professional and not some 12yr old trying to run a business out of my dads basement. Are people really so stupid that they think that we don’t check what is submitted to us and that we will list any keyword stuffed rubbish they care to submit? We want the web directory to exist for many years to come, one way to do this is to list quality sites with good descriptive text. Categories full of keyword stuffed entries will not help in this endeavour, sure it might help the listed site with good back link text right up until the directory is dropped from search engines for being a spam filled waste of space. If people used some common sense they’d realise that they should be helping to make the directory as good as possible, because if the directory is good it will attract not just spiders but real humans. After all it’s humans that actually buy goods not spiders. To be able to offer free submissions and keep up with the flow we have just seconds to look at the submitted text and decide if it’s worth taking the time to review the site for inclusion or if to discard the submission and move to one where the site owner took the time to submit properly. While paid submitters sometimes assume that rules don’t apply to them and will spam fields, we do have the time to rewrite the text to be suitable. Therefore should we simply say enough is enough and go paid only thus people will loose out on free promotion of their site all because they couldn’t be bothered. When you talk to submitters that have done it incorrectly you often get replies such as “I don’t care about your categories I just want PR”, and it is this mindset that seems to dominate. In the case of the submitters ignoring category structure what they are forgetting is that search engines do like relevancy so if we did accept it as-is it really wouldn’t be doing them any favours. I think the problem stems from people just looking at directories as a back link and they must get as many links as they can. This seems to be backed up be the fact that we allow listed sites to push short news items to show on our home page and in the archive, however it’s not a permanent link so web masters dismiss it. What they have forgotten is that we have tens of thousands of visitors per month so displaying their news on the directory makes it visible to all these potential buyers. At the moment we don’t even charge for this! Another directory owner once said to me we shouldn’t be complaining about our submitters but rather educating them? The problem is how do you educate submitters when they can’t or just won’t read the simplest rule? Today sees another update to the directory script that powers World Site Index, this update brings with it various enhancements such as a word cloud of the latest searches and top searches. One of the more important developments is the ability for listed sites to push news to World Site Index for display in real-time. Currently any listed site can make use of this live update ability via a simple PHP script. This news system allows site owners to deliver up to date information to the thousands of people that visit World Site Index as well a providing visitors with current information. To find out how to start pushing news please see our HOWTO push news guide. Developers can find out more in our directory script community forums.